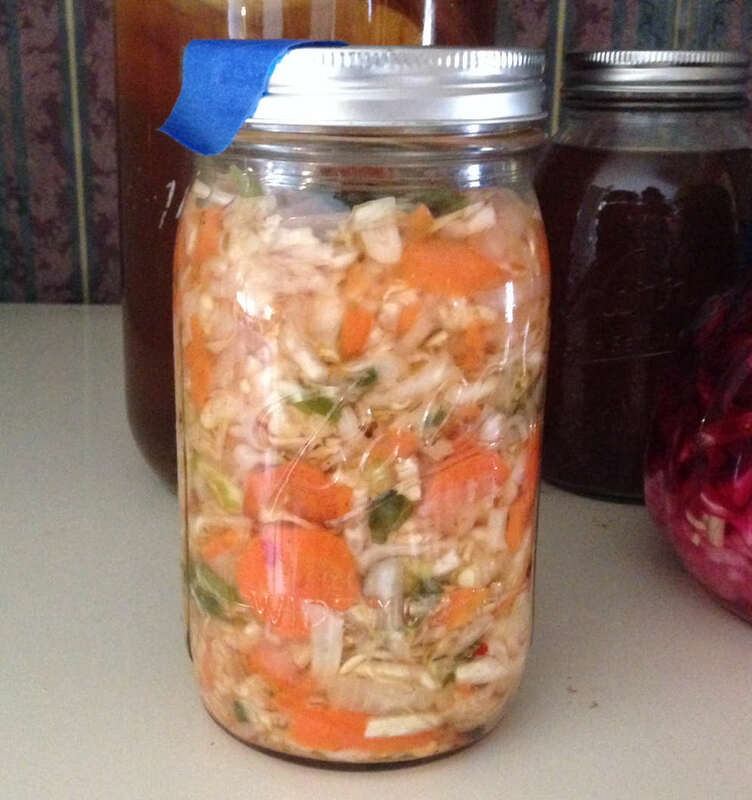 Fermented Foods Part 2 - 'Kraut and Kvass and Whey, oh my! Home » Cooking » Sauerkraut and kefir and kvass, oh my! Yesterday, I wrote about my newest micro-obsession with fermented foods. Then I posted to Facebook inviting people to follow if they wanted to see what was happening. Whatdya know? People liked the post. But, that means I hafta write a follow up post, and this is it! I spent almost all of the day yesterday (January 4, 2014) in the kitchen. I went out with Jeanette to pick some young kale in the winter garden, I sat down to lunch – farm fresh eggs scrambled in with a bunch of vegetables, including the beet greens from the kvass I was making, and I wrote the blog post, and I sat down to dinner. That was it for time out of the kitchen. During that time, I was a bit slower than I thought I might be… I was talking with Jeanette (who was with me most of the day cleaning off our old baker’s rack which we replacing with a steel shelving unit) and bouncing recipe ideas off of her and thought I would make 4 batches of ‘kraut, along with the kvass and then start on the kimchi. Ha! 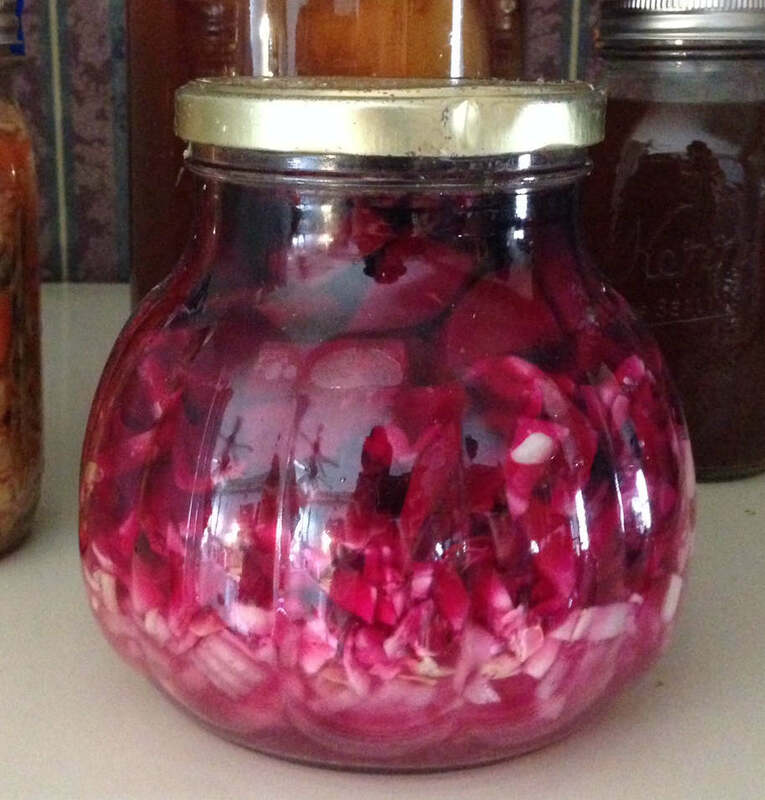 Instead, I made my kvass, ate lunch, worked with Jeanette to wash all the dishes, and then managed to make one batch of ‘kraut. But what a batch of kraut it’s gonna be! Chock full o whatever veggies I had on hand and a traditional cabbage base. I wanted a veggie kraut instead of the plain old cabbage kraut. Shred or chop or dice all the vegetables and toss into a bowl. Add dry seasonings. Mix it all up, mash it all up (I used a very large wooden pestle), stuff it into a quart jar making sure that you include all the liquid from the mashing activities. Top it all off with the liquid ingredients. Cap and give one shake. Uncap and press everything down with the base of a very clean glass, bottle or small jar – the goal here is the get all the vegetables to sit beneath the liquid. Cap loosely and set in a warm, dark place. The cabbage in the bottom is your basic green cabbage, but it’s coloring nicely. It even looks like a Klingon drink in the making! Shred cabbage, dice onions, mince garlic and place into 2 quart jar. Peel beets and cut into 1 inch squares to top cabbage mix. Add salt, whey and water to one inch from top. Cap loosely and set in warm dark space to ferment for 3-7 days. Scrub beets – as many as you want. Place in foil lined pan. Cover with foil and scrunch the edges. Bake at 350° for about an hour. Take one really expensive set of headphones by Dr. Dre, season to taste, wrap in tinfoil and place in oven until ruined. All of the recipes I researched called for whey. A lot said it was optional, but the title of the recipe would be “lacto-fermented this” or “that lacto-fermented,” and I almost panicked. Fortunately for me, I know that Jeanette is a wonderful cheese maker and would know all about whey. Unfortunately, it’s winter and the goats are drying off as the get ready to freshen in the Spring. Dilemma! Not so, she assured me. Strain a little plain yogurt – store bought works fine – to get most all the whey you need for the recipes on this page. We used less than 1 quart of yogurt to get more than 1 1/2 cup of whey! And the remaining yogurt cheese is a simple and delicious creamy cheese spread (we had ours on garlic toast with the egg and beet green lunch). On the subject of whey, I use powdered sweet whey that I get through frontier herbs, 2tbls per loaf of bread. I wonder if I could use the yogurt liquid instead and how much? Beets in groups of three? I thought they grew singularly, but then I am from the south and beets are a foreign veggie.